The year 2004 saw the start of the coffee revolution when Espresso became the city’s first espresso bar. Since then, the city has witnessed a cultural change where going for coffee or ‘doing’ coffee most often means meeting at an Espresso coffee house. Espresso serves its premium coffees in Karachi at four locations; the original espresso bar in Zamzama, the coffee house on Khayaban-e-Shahbaz, the Forum Mall, and the latest outlet at Dolmen Mall Clifton. 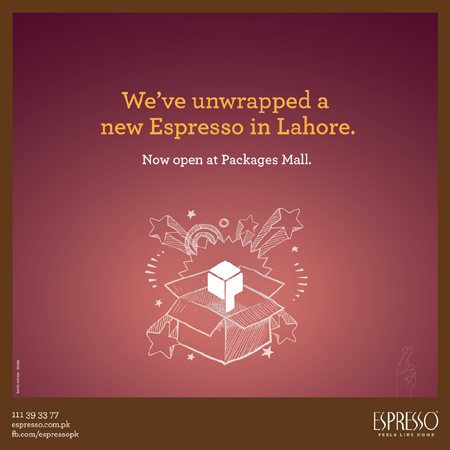 One can now sample these premium coffees in Lahore as well at Espresso's new location on Defence & at Mall 1 Gullberg . All outlets offer seamless Wi-Fi. 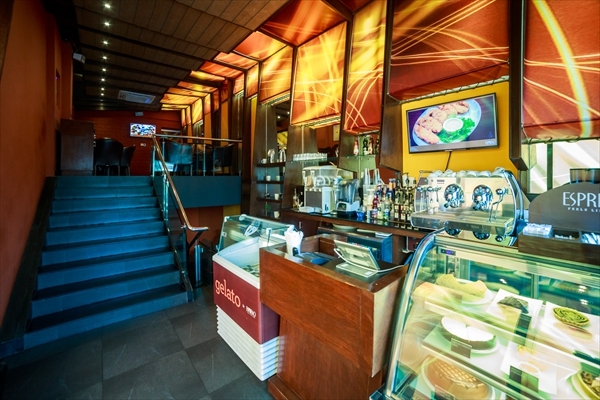 ESPRESSO boasts a menu packed with mouth watering appetizers, a selection of sandwiches, wraps, pastas, paninis and divine desserts. A sizeable range of teas, smoothies, hot & cold beverages and an array of coffees all created from the finest imported and local ingredients are available. Jump start your day at ESPRESSO, when the coffee machines start pulling espresso shots, enjoying the best breakfast and brunch one can get in Pakistan. Pop in all day to catch a bite, have a coffee or just meet up with friends till late at night. Open from 8:00 am till 1:00 am on weekdays and till 2:00 am on weekends, ESPRESSO is here to serve you. The aroma of full bodied coffee and the taste of wholesome quality food served up in a chic and stylish space makes it an irresistible hangout. There is also the ESPRESSO privileges membership “the card” that earns you rewards each time you visit any one of it's coffee houses. There is no doubt that ESPRESSO is the preferred choice for people of all ages, making it the best coffee house in town. Reservations: Reservations not required. However, Espresso appreciates if parties of 8 or more call ahead of time so they may arrange accordingly. Catering: Special outdoor event coffee and food catering available upon prior notice. Children & Family Polices: Children under 12 strictly not allowed after 7pm. In order to maintain a relaxed family restaurant atmosphere, we do not allow parties of single males after 7 pm . Smoking: Cigars & pipes are strictly not allowed. Non-smoking section available at the Chez Casa branch. 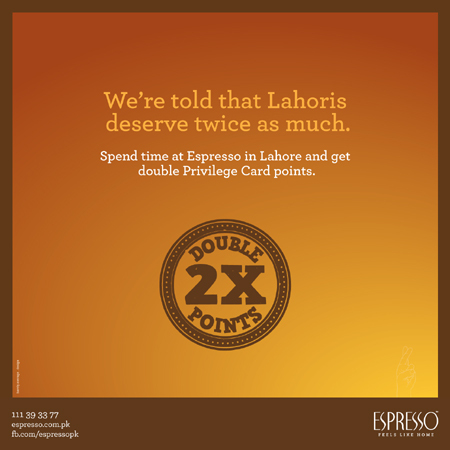 Espresso Privilege Card: For every 100 rupees you spend, you get 5 points. Each point is worth 1 rupee. What to Expect: Friendly service, high quality food, drinks and pastries, a hygiene conscious staff and a trendy, energetic atmosphere. On LahoreSnob.com, we take your reviews seriously. Comments are forwarded the the business owners when possible. Commenting also helps us to determine which businesses get approved for a listing on our site. When you want an effective way to express yourself while creating real change and results in our local businesses, you can rely on LahoreSnob.com.